You have to purchase a from server's shop or achieve them through events/quests. | How to use it? 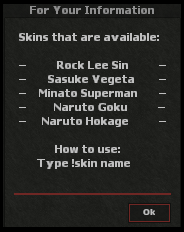 | Type !skin info to see available skins. 1. Question: How can i get back to my normal outfit? 2. Question: When i set the outfit is permament? Answer: Yes it stays permament untill you die or relog/revert. 3. Question: When will new skins be realeased ? Answer: It all depends if our pixelarter has time. 4. Can i have more then 1 skin? 5. I got the same skin from random skins box more than once why? Answer: No. we made it harder to get all skins so there is a chance skins will repeat from box.